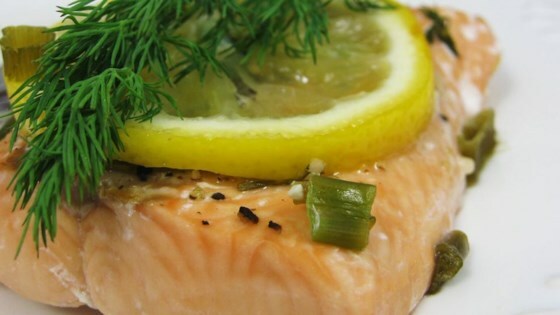 "A large salmon filet, steamed in foil and cooked either in the oven or barbecue. It's seasoned with minced garlic, fresh baby dill, lemon slices, fresh ground pepper and green onions." Okay. Don't really like poached fish. Salmon seems to lose its distinctive taste cooked this way. Tried it once. That was enough. This was very good. I didn't have the dill, so I substitued italian spices and I used lemon juice instead of the slices. It was perfectly cooked and very tasty. I will be making this again.